The Book of Common Prayer is a central part of the Christian faith as practised by the Church of England. It is used in over 50 countries and in over 150 different languages. This year sees its 350th anniversary. During the 16th century, England was beset by religious upheaval, beginning with the break with Rome during the reign of Henry VIII. Henry VIII was in his youth a committed Catholic, hearing up to 5 masses a day. He defended the Roman Catholic Church from the heresies of Martin Luther in a book he wrote entitled The Defence of the Seven Sacraments, a book for which Pope Leo X awarded Henry the title “Defender of the Faith”. The initial break with Rome was therefore more a political change than a theological dispute, essentially brought about by the desire of Henry to divorce his wife Catherine of Aragon in order to marry Anne Boleyn. However, by abolishing papal authority, it opened the door for reformers who now entered the political arena. On Henry’s death in 1547, the young Edward VI came to the throne. He had been raised a Protestant and advised by the Duke of Somerset, the Lord Protector, he oversaw the banning of Catholic practices such as processions, the tearing down of images in churches, destruction of stained glass and rood screens and the selling off of church plate. In 1549, Thomas Cranmer, Archbishop of Canterbury, introduced the first Book of Common Prayer, laying out the new rules for worship. It was written in English, and contained all the orders of service for the day in one volume, with the services for the sacraments. Revised in 1552, this Book of Common Prayer did not last long as in 1553 Edward died, and the Catholic Mary came to the throne. The old methods of worship were reinstated. On her death, the religious landscape changed again with the ascent of Elizabeth I. The 1552 Book of Common Prayer was reissued in 1559 with a few modifications to make it acceptable to more traditionally minded worshippers, and the establishment of the Church of England really took hold, a church that was to be both catholic and Protestant. However, this one size fits all did not please everyone, and was not the end of the religious troubles for England. A century later saw the English Civil Wars of Royalty versus Parliament, Puritan versus Presbyterian. On the restoration of the monarchy, Charles II sought to overcome this turmoil, and set about restoring the Church. In 1662, a new Book of Common Prayer was released, and it is this volume whose anniversary is celebrated this year. On the 19th May, royal assent for the new book was granted, and it came into use on 24th August 1662. It remains the official prayer book of the Church of England to this day. 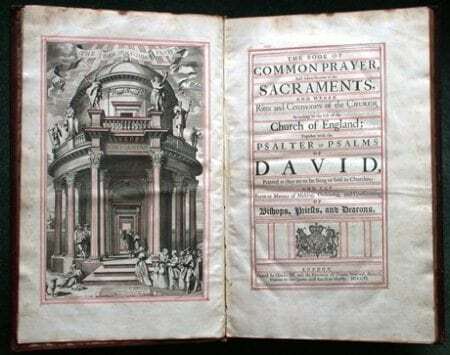 The full name of the 1662 Book of Common Prayer is The Book of Common Prayer and Administration of the Sacraments and other Rites and Ceremonies of the Church according to the use of the Church of England together with the Psalter or Psalms of David pointed as they are to be sung or said in churches and the form and manner of making, ordaining, and consecrating of bishops, priests, and deacons. This edition was printed in London by Charles Bill and the executrix of Thomas Newcomb, printers to the Queen, and dates from 1706.